In the last few weeks, since I returned from Europe, I learned so much through the experiences that I found on my path, without planning to learn anything, that it became clear I wanted to write about the experience of learning all the time. I decided I wanted to expose the bits and pieces below for the purpose of showing, both myself and others, how everything that happens, happy or not, can support our movement toward where we want to go. If you are reading this blog, you know that I am plagued by a fundamental and deep impatience fueled by a deep longing for an entirely different way for us, humans, to live on the planet. The vision is strong, and what I most want is companionship, many people willing to join me on this amazing journey to a profound personal freedom that will allow us to take a stand and, together, turn the tide. I am dedicating this sampling of my learning, these very personal reflections, to this bold vision, without quite knowing what connects to what. At some point in the last few weeks, since being back from a month of workshops in Europe, I reflected on what made this trip so profoundly satisfying for me. Yes, it’s always satisfying for my work and offerings to be received enthusiastically, and yet I know that wasn’t it. The answer, when it came was deeply resonant. Everywhere I was in Europe, I was with people who love me and whom I love. When surrounded by love, I can breathe differently. I don’t have it at home, not in this same way. The many people in my life that I share love with are not with me all the time. Some uncertain part within me is still insisting that there is something unusual about wanting it, that this is not how life works. I refuse to believe this part, because I think I know better. I think I know that my experience is accurate to being human. We live, in my opinion, so far from what evolution designed us for: to be in ongoing connection with others. The isolated life of modernity doesn’t suit me. I know that for sure. I suspect fully that it’s not satisfying for others, either. Of course I can’t know, and I want to remain humble about it. It may, indeed, be that I am unusual in not being able to rest in a place of full individuation, living as a separate and unique one person. How ironic, considering how much I feel myself to be different, other than most, and still, I want and long to live surrounded by and immersed in love. I am not willing to give up any more, even if it doesn’t ever happen. One of the things that are most challenging for me in life is when someone else’s behavior is incomprehensible to me. Even if the person is dear and close, they become foreign. It’s not quite that I judge the person, although it’s clear to me that that person may well experience it as such. It’s an experience of aloneness, mystery, and anguish. It’s particularly intense when the confusing behavior appears to me to be lacking care. During these last few weeks, I sat down with a person dear and close whom I will call Amanda, who, for several weeks, acted towards me in ways that I didn’t know how to interpret except as a total absence of care. This is someone I see very regularly, so avoiding the issue was not quite an option (yes, these days, with the stress on my plate from so many directions, I do opt for letting go of resolving conflicts some of the time, with immense sadness and loss). As big as my anguish was when we started, a few minutes into the conversation it got even harder. I had to resist decades of habits of giving up (only locally, never globally, I now know of myself) in order to choose to refocus the conversation on me when Amanda shifted focus to herself just as I was finally starting to talk about my own experience. The level of my anguish was big enough, and Amanda’s feelings that kept her from staying present with me intense enough, that I am convinced that most people would have given up on the relationship at this point. The intensity, for both of us, was because we didn’t have a shared meaning for what our conflict was or wasn’t. Still, we didn’t give up. We talked and cried for a couple of hours, and practiced the full art of dialogue, both of us being deeply immersed in the practices of Nonviolent Communication. There was nothing about rightness or fairness. It was only about what was possible, for either and both of us, at any moment in the conversation. We managed. I understood, in full, the source of her behavior. It helped immensely that she was able to acknowledge, with extreme sadness, that, indeed, she had no access to care in the severity of what her experience was. That, finally, allowed me to be able to make sense of her human choices. Once that is in place, compassion is restored, and two-way flow is possible again. What a triumph. I was spent at the end of the evening, and deeply grateful to Marshall Rosenberg, without whose discoveries and teachings I would never have learned what I now know that helps me stay through these excruciating conversations. The very same day in which I had the acute episode of helplessness and resentment I wrote about last week I had a complete meltdown about marketing. Dear friends of mine who understand a whole lot more about marketing than I do were giving me advice and providing feedback that was really challenging for me to take in, creating a tear in me between being accessible and being in alignment with myself. This happened gradually, so I didn’t feel the erosion of integrity in me until it was really loud, so loud that from one moment to the next I just couldn’t continue in the process. Instead of revising words and paragraphs, or offering alternative bullet points, which I had already done more than once, I crashed. Leaning on the trust and love in these longtime relationships, I let it loose. I don’t even know exactly what I wrote, I just dumped all the agony that was living inside me. Although I didn’t have any judgment of them, and I took responsibility for my experience and feelings, I wrote without sufficient clarity, because I had no idea what I wanted instead. I just reached my maximum. Instead of caving in (which I do, all appearances to the contrary notwithstanding), I stood up for myself, even before knowing what I wanted. The next day I had a conversation with my sister Inbal, who helped me name clearly what I wanted, the very core foundation of the entire practice I live and teach. Another friend supported me by writing a draft of an entirely different approach to the marketing. I breathed a sigh of relief, and sat down to complete it. Then I sent it to the original people, and they liked it without any further suggestions. I was so deeply grateful to them, and so delighted that my sense of trust was reciprocated. Moral of the story: speaking my truth doesn’t have to threaten relationships, erode trust, or have unpleasant outcomes. It might, and it sometimes will, and it might not. It could also, instead, sometimes lead to results that everyone likes better. Especially , especially when longstanding love, trust, and shared practices exist. Exactly what I teach people became true for me in that moment. An unexpected benefit: I learned something about marketing that I am hoping to hold on to for a long time. Marketing must be accurate and honest about what is being offered, so the right people are attracted, not just any people. Regardless of how many or few are the right match, they are the ones that will make the endeavor thrive over time. The more I can be clear about what it is that I am offering and who would be a fit for it, the more my marketing efforts will fulfill their purpose: creating sustainability through discernment and selection. Dare I hope that my growing resilience represents a permanent change? In my last post, about acceptance, I already wrote about how I learned to see that mourning can be a way to reach acceptance (it was that piece that cemented in place the idea of writing about what I have been learning in the last while). Now, as I am reviewing these weeks, it strikes me that the kind of acceptance that mourning allows would of course create more resilience. When I don’t fight inside myself with what is, when I can make peace with things being exactly what they are, so much energy stops being wasted. I then have my energy to choose what to do and how to respond. That is, perhaps, the serenity of that famous prayer. The wisdom to tell the difference comes from that peace. Then, if I choose to put efforts into creating change, there is peace and determination that motivate me, not helplessness or unconscious urgency. And when I choose to put my efforts elsewhere, I am not eaten inside by the continued illusion that things could be other than what they are. Perhaps my growing ability to do this is what allowed me to be back on my feet the day after receiving two major blows: the marketing challenge I just wrote about, and an experience of mismatch with regards to love and priority with someone truly dear to my heart. I was so distraught at night, and better by midday the next day. Not days or week or months, as it used to be some years ago. Only hours. Considering how difficult the times are globally, the continued presence of my sister’s active cancer, and the simple and ongoing challenge of being me in this world, this is a truly welcome relief. May it last. 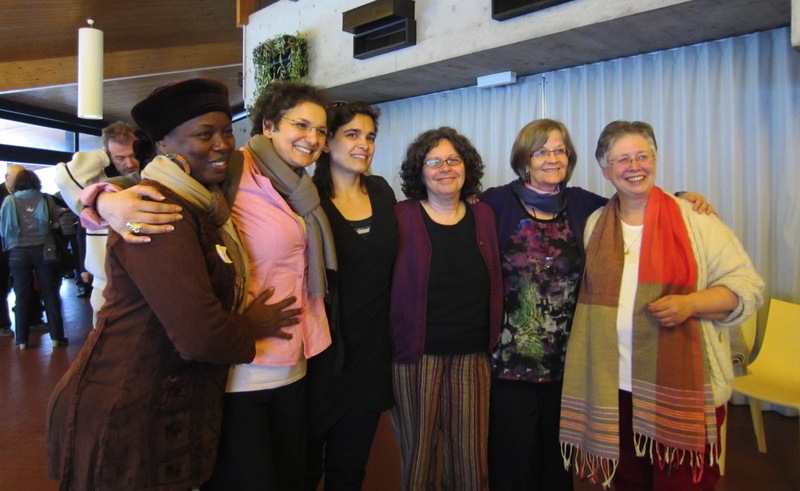 Photo at top: Miki (third from right) with the organizers of her recent workshop in France. Click here to read the Questions about this post, and to join us to discuss them on a conference call: Tuesday April 23, 5:30-7 pm Pacific time. This is a way that you can connect with me and others who read this blog. We are asking for $30 to join the call, on a gift economy basis: so pay more or less (or nothing) as you are able and willing. This entry was posted in Uncategorized and tagged love, marketing, resilience, trust on April 18 / 2013 by Miki. So loving much of what yo have written here. The marketing piece speaks mostly to me at the moment. I too have been in a hole about what I want – just the simple naming of it. I too did got support this morning and got to do a mediation with the parts of me at battle about marketing ME !!! and my efforts. I am relieved and comforted by how you spoke your truth with care and responsibility re: marketing even though you did not yet know what you wanted. I now have a sense of inner freedom that I don't have to have all the answers before speaking. I can say, "Where I see us going now does not work for me. I'm not clear yet where exactly I want to go, but I know it's not there."